The image of the sea runs richly through our visual traditions, from the paintings of Turner to the prints of Hokusai, in the photographs of Gustave Le Gray and Hiroshi Sugimoto. Images of the sea invite us to reflect on our relationship with nature, on the sea’s vastness, power and mystery. As a subject the sea invites use as symbol and metaphor for everything from the divine, to our mortality, to our own psychological depths. Historically the sea has been set against us, it’s profundity and ceaselessness in contrast to our constructions of time and space. Photographers’ seascapes are as varied as are individual photographers (see Sea Change, the catalog of the CCP’s 1998 exhibition for nineteen photographers’ approaches to seascapes – Brighter Later would certainly have fit well in this project). In Brighter Later Brian David Stevens presents a series of seascapes that, while systematic in their organization, feel very personal. Beginning in 2007, Brian David Stevens travelled by land to Britain’s coastal counties to photograph the sea. Brighter Later presents thirty-four pairs of photographs from this project, made in thirty-four different counties, a typology of views of the water. The book is laid out simply, with text printed in grey on a translucent paper, providing an ethereal effect overall. The sequence of photographs circumscribes the British coast in a clockwise direction, from Kent on the South East coast, around the Southern coast of England, up Wales, around mainland Scotland, and back down ending in Essex. As Stevens describes it, it’s a portrait of Britain that looks out from the island, rather than at it. The project follows on traditions of looking at, and going to the sea; of Britain’s history being informed by being an island, and the sea being the source of food, commerce and threat of invasion; of the idea of the seaside in English, Scottish and Welsh imaginings of leisure and work. In his introduction he quotes W.G. Sebald’s The Rings of Saturn, also a pilgrimage contemplation of Britain, where Sebald describes sea fishermen on the shore: “They just want to be in a place where they have the world behind them, and before them nothing but emptiness.” Stevens takes this emptiness as a point of departure: “To me it was a space wanting to be filled, a space of optimism and possibilities,” observing that Britain’s history can be told through what has come and gone across its shores. As a typological series, Stevens’ pictures are unexpectedly romantic. Where some typologies seek to draw attention to regularity, Stevens’ images are unapologetically specific, the direct result of his decisions- of location, composition, timing, weather. They are beautiful in their range of whites, blues and greys; gorgeous clouds and murky hazes, the sky taking up half or more of the image; rippled waters speaking to endless movement; the occasional beach; and always the horizon line. They play off of our associations with the sea, its endlessness seen at a comfortable, safe, familiar distance. They are quiet but evocative, and while individually they are understated, collectively they combine to form a larger, substantial body. Stevens establishes clearly that these images are not about views, but rather about looking - about being on the coast, looking at the sea. The system of photographing in each county is less a matter of providing a “typical” representation of each place than of laying out a path on which Stevens can lead his viewers. That said, I would not be surprised if residents of some of these locations might recognize a certain piece of horizon as their own. Stevens’ own acts of looking – which speak to his own memories of looking at the sea as a child - invite associations with the reader’s experiences of standing at the edge of the water. In a blog on Caught by the River, Stevens has published short essays on his individual journeys (not included in Brighter Later). Alongside his discussions of his travels, he includes poetry about the sea, historical anecdotes, and his own reminiscences: in Glamorgan, for example, he revisits the yard for retired train engines where he played as a seven-year-old visiting his cousin. While this information isn’t available in the book, it’s a sentiment that is inscribed in the photographs, easily available to viewers as a canvas on which to project their own nostalgia. Thus driven by the pilgrimage as much or more than by the view, Stevens has designed a strategy to make his pictures of the sea about his journey to make them. A family friend had reminded him of how he, as a child, would look at things through one eye and then the other. Drawing a connection between past and present, Stevens displays each coastal photograph as two different square-cropped versions of the same rectangular image, set side by side. The pairs call to mind stereographs, Victorian photographs made with a camera that would produce two images in parallax that, when seen through a viewer, would create the illusion of depth. They also look like they might be sequences, two frames following close on one another. The move is unusual but effective: we feel how fleeting the moment is in which Stevens has made his exposure. The realization that time has not passed between the two photographs, when one thought that it had, has a peculiar effect, the temporal equivalent of missing a step on the stairs, in some cases almost a déja vû. They present the same moment, the same scene, the same photograph, as two different photographs and in so doing shift the mode of representation from descriptive to experiential. Even as one picture ends another might possibly extend past its framing. Once we understand that the pictures are not meant to exemplify their ostensible subject, the county, and that Stevens is guiding us, then the tour around the island begins to feel like a very different journey. These are among the most inviting seascapes that I have seen; even if you have not been to the British coast, the pictures nonetheless call up the feeling of standing at the edge of the water. 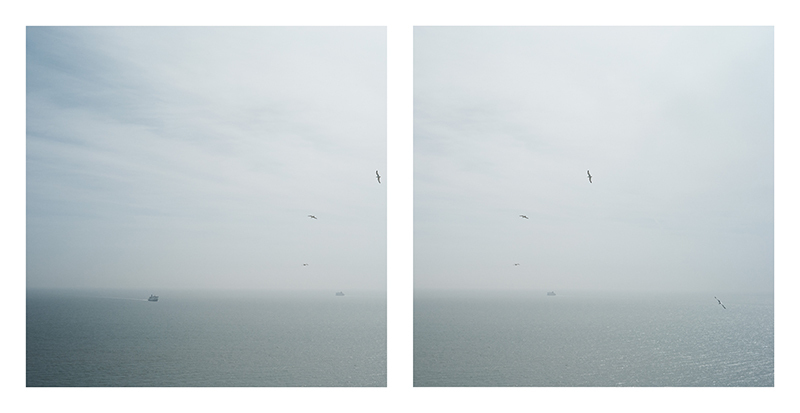 By shifting the project from what is seen to how it feels to see, Stevens invites us to reflect on how we position ourselves in relation to the sea, and how the sea positions us in relation to our own past. Inventively, he plays with the idea that a photograph is bounded by its frame, and unbinds it with his pairings. The canny design of the project and the book bring us right up to the shores not only of the large reaches of the sea but also, potentially, of our own memory.